Babblings of a Mommy: Neon French Mani: A Must-Try For Spring. Neon French Mani: A Must-Try For Spring. Raise your hand if you're ready for Spring? I know I am! I'm over the crappy weather already, but I know something that will make our day a little brighter - a neon french mani! I found this pic on pinterest and think it's such a pretty way to jump on the neon trend even if you're a little shy about the ultra brights. It looks really simple to do too! Just pick some colors that really make your nails pop and pair it with a natural flesh tone base. Easy Peasy! What do you think - would you try a neon french manicure? 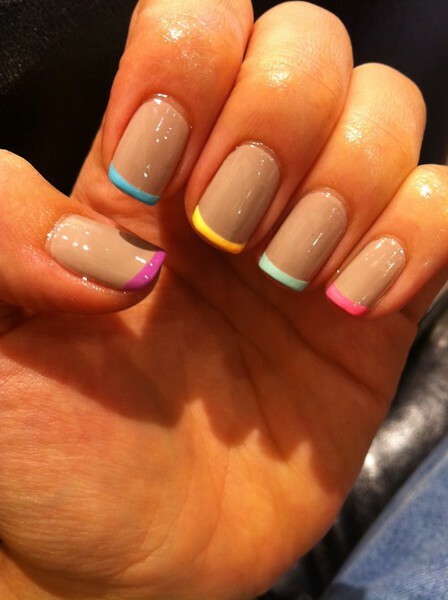 I am so doing this mani! I am already wearing bright blue! So ready for spring! Oh I love this! So fun for Spring!